Where could you find 6 wellness practitioners sharing their expertise, love, and devotion to creating more health and providence in your life? 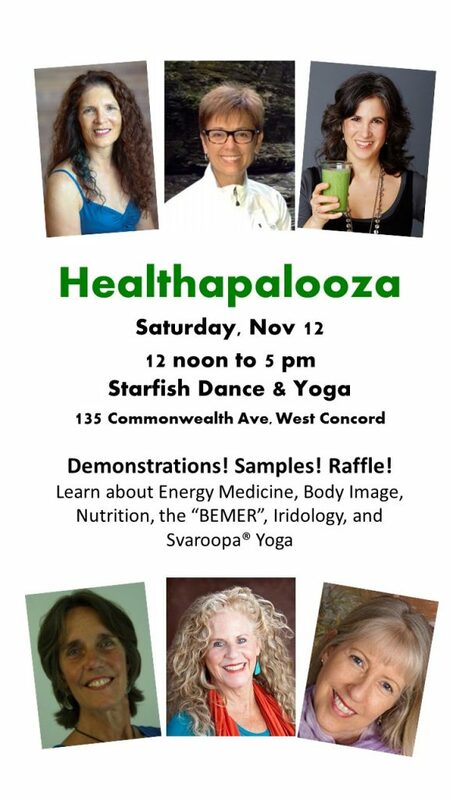 At the November 12th Healthapalooza from 12 noon to 5pm at the Starfish Dance & Yoga studio, 135 Commonwealth Ave, West Concord. Demonstrations, mini-classes, and info sessions will be offered by 6 experts during this afternoon to acquaint you with ways to improve your health and wellness. Come learn how to improve and maintain your physical, emotional, and energetic well-being during this interactive and free event! Informational sessions will include: Energy Medicine, Nutrition, BEMER, Iridology, EMDR, and Svaroopa® Yoga. Attendees can participate in demos, classes, and get answers to personal questions. The list of practitioners includes: Sheila Peters, Nina Manolson, Sunshine Beeson, Lisa Pearl, Linsey Hurley, and Lissa Fountain. Go to our website: www.starfishdanceyoga.com for detailed schedule of practitioners and free classes. Maria Skinner is the owner of StarFish Dance & Yoga (formerly Yoga & Nia For Life) in West Concord, MA. She is a BeSoul Dance Practitioner, Nia Black Belted, former Nia White Belt Trainer, creatrix of Moga and Elements in Movement, MoveMyWay, and Embodied Astrology. She is also a Certified Ageless Grace® Educator. Maria co-authored the Spanish translation of Our Bodies, Ourselves; Nuestros Cuerpos, Nuestras Vidas; and contributed to My Hungry Head by Marybeth Sherrin. Sheila Peters is an Energy Medicine Practitioner, Reiki Practitioner, and has been dancing professionally for over 35 years. Sheila creates classes, workshops, and private sessions that utilize energy medicine principles and movement skills to help increase vitality, reduce stress and anxiety, strengthen the immune system, improve focus and concentration, aid both personal and working relationships, and facilitate transformational change. She holds a BA in Dance and a MS in Leadership. Nina Manolson has over 25 years’ experience in the health and wellness field and is the recipient of the prestigious Integrative Nutrition Health Leadership Award. She holds a Master’s degree in Counseling Psychology and is a Certified Holistic Health Coach, Certified Psychology of Eating Coach and Teacher, and the author of Feed Your Kids Well in a World That Doesn’t: An everyday guide to making healthy food happen in your home and beyond. Nina is also a Bodyworker, Bodywork Teacher and Yoga Teacher. Linsey Hurley is a certified Holistic Health Coach and has been working in the Health and Wellness field for over 25 years. Certified in Bach Flower Therapy and Reconnective Healing, Linsey utilizes many different modalities such as essential oils, homeopathy, and low level laser therapy in her practice. Linsey now focuses her time on BEMER therapy, which is an exciting new medical technology that enhances circulation at the capillary level, and therefore stimulates the body’s own self-healing capabilities. Sunshine Beeson is a certified Iridologist and does holistic coaching and counseling work. Her training includes Western Herbs, Diet & Nutrition, Chines Herbs, Ayurvedic medicine, Aromatherapy, Bach Flower Essences, Psychology/Counseling. She had been initiated by Native American Southern Ute Tribal leaders to facilitate sweat lodges for the past 25 years. Lisa Pearl, MS, RD, LDN, CEDRD, CEDS, is a licensed clinical nutritionist and eating disorder specialist. She is the founder of CNC360 as well as a clinician with over 30 years of experience in providing treatment, education, training and mentoring in the field. Lisa’s services include nutrition therapy, case consultations, and professional supervision. Lissa Fountain is a Leading Svaroopa® Yoga and Meditation teacher, as well as an assistant teacher at Svaroopa® Vidya Ashram. For 18 years, she has been teaching yoga and meditation classes and offering Yoga Therapy throughout Metro-west Boston. In 2008 she was invited to become a national teacher for Svaroopa®Yoga and Meditation, and has been enjoying leading Weekend Workshops for yoga studios across the country ever since.